The city was founded in 1570 by the emperor of India Jalaluddin. It is not named after him, however, — the name means “abode of splendid”. There is not much to see in Jalalabad: in the last 25 years the Russians, the mujaheds, the Taliban, the Northern Alliance, and the USA have painstakingly removed all the splendor from here. Almost all historical sites have been destroyed, including King Habibullah's palace that lasted to the very end and was raised to the ground by American bombs. But the Habibullah's mausoleum is that last remaining monument. He was killed in 1919. His three sons are also buried here, including King Amanullah who has died in Zürich in 1960 after being exiled from Afghanistan. His wife Queen Soraya has died in Rome in 1968 and is buried here too. Currently a school operates in the building, but you can visit it and see the graves. 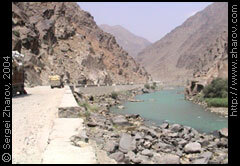 Jalalabad surroundings are full of places important for Buddhists. A hundred thousand years ago Buddha lived here in one of his previous lives. After getting enlightened, he has come here once to reprimand a bad-behaving dragon Gopala. That dragon originally was a shepherd but has committed a suicide, turned into a dragon, and began harassing his co-workers. Buddha has put him on the right road and left his own shadow in a cave for the dragon to get inspired. For many centuries after that people — including the non-suicidal and non-malicious ones — have been coming to the cave for inspiration. Right near the cave there was a stupa with Buddha's hair and a nail left there during the dragon-related visit. There also were stupas with his staff, a robe, a piece of skull, and an eye — looks like he was practically torn apart for souvenirs after his death. None of all that has made it to our times although in the 7th century everything was intact and the locals made good money by letting the pilgrims touch these relics. A village named Hadda — 11 km from Jalalabad — was the place of about a thousand of stupas and even a whole monastery, Tapa-i-Shotor. The locals were very brief about it, “There is nothing there.” After the trip, I saw the following phrase in a Russian war memoirs book, “Near Jalalabad a village Ada has been the «target of the day». The mujaheds would periodically open fire from there at a military airport nearby. The helicopter pilots repaid in kind and have eventually raised the village to the ground.” This probably explains everything. Shewa, a village 28 km from Jalalabad was a place where local artisans produced colored boxes. The village is more or less intact, but after 25 years, nobody could say anything about the boxes although people were delighted to hear that they have been producing these nice things in the past. A taxi from Torkham will likely bring you directly to Spinghar Hotel. Not so long ago all foreigners were forced to stay there for crazy money, but luckily the warlord who owned it has been killed, and although the hotel is now owned by his successor, the new guy respects free market ideas. Spinghar is a foreign morons' demoneying center and has lots of local freeloaders waiting for rich journalists to come. The hotel is situated in a big garden and is quite impressive in general. Rooms come in pairs, each pair having its own bathroom with hot shower. There are three beds in each room. There is a ceiling fan, but power blackouts are frequent in this city. It is very quiet here. They ask for 50 dollars but will accept 15 if you say you are not a foreign moron. There is a good restaurant, but prices there are too high — two–three dollars per dish. One big drawback is that the hotel is full of the locals preying on rich foreigners. They offer translating services for 100–150 dollars per day. In reality you can hire one for 10 dollars, and you can get a free translator on the street where you will likely be approached by local teens wanting to practice their English. On the other side, those professional swindlers have a good idea of what is interesting for a foreigner in and around Jalalabad. So, you may decide to get one of them for ten bucks and hire a taxi — about 17 dollars for six hours. There are a few other hotels on the same street, about 20 minutes of walking to the east. There was a report of a tourist being robbed in one of them. They charge the same amount as Spinghar, and quality is much lower. You should stay there only if you can not get the price down in Spinghar. Try to pay about 10 dollars per room. You are unlikely to see anything here except the main street where Spinghar is. Turning left — east — when exiting Spinghar, you will head to the city center. On your left hand there are ruins of the king's palace. A little bit further down, and you see a flea market and a few carpet shops on the right. It is not that exciting, but you can look through the stuff. If you turn this way, the Habibullah's mausoleum will be in the end of the market. Continuing along the main street, you pass though a small square with taxi stands and a photo shop. Then on the right side there will be those alternative hotels mentioned above. One of them has a restaurant — the only known place to eat other than the Spinghar's restaurant. Prices are fair here. The staff does not speak English but is friendly. Passing the restaurant you get to the central square with a traffic control booth. This is where the phone center is, and you can call home from here. Turning right on the square, you get to the commercial area. This is the place to exchange money. On the road itself there are mobile exchange units, and the stationary offices are off the street, in the yards. As a first Afghan city on the way from Pakistan, Jalalabad is more or less interesting, but you can skip it if you are coming in the opposite direction, or lack time, or it is not on the way at all. The bus station is about 2 km from Spinghar, but it is hard to find the way by yourself. A motorickshaw from the hotel should cost about 50 cents. A seat in a minibus to Kabul is $3.37. The road is heavily bombed but goes through a picturesque area. It takes six hours to get to Kabul.